« A World Without Oil? You talk about ‘being socially relevant, environmentally responsive and economically viable’. What do these terms mean? How is this any different from Corporate Social Responsible (CSR) plus Green IT plus traditional profitability, all rolled into one? Isn’t it simpler to talk about concepts that are already known, using words that people already understand? We’d love to use words that people already understand. After all, making ourselves understood is the first thing we need to do, if we are to be successful in our business goals as Trusted Advisers to our clients. Trouble is, the ideas we are talking about have not established their own vocabulary yet, and in many cases, are just slightly different from similar sounding concepts, and so we made up our own terminology as we thought-through issues around sustainability. We hope our terminology sticks! Let’s take these three terms one by one and then get to the other related questions. First let’s set the context by mapping all stakeholder communities that make up the ecosystem of a business enterprise. We use the term stakeholder here in the same sense as the ‘Stakeholder Theory’ propounded by R. Edward Freeman in the 1980s and it is useful to clarify this because sometimes people confuse stakeholders to mean (only) shareholders. In our context, a stakeholder is any entity (could be a legal entity such as a business, a not-for-profit organization, an institution, a cooperative, or just a community or group of people) touched or impacted by the business. Increasing globalization of the creation and delivery of goods and services is adding to the diversity and complexity of the types of entities in the stakeholder ecosystem. 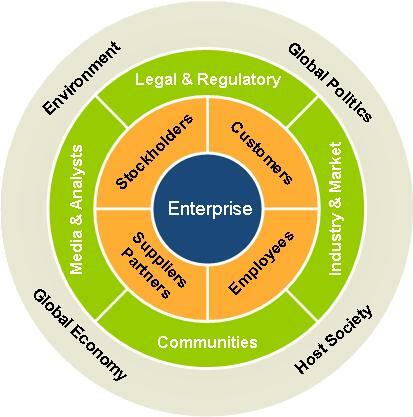 As you can see from the diagram (below), the stakeholder ecosystem of a business enterprise has a core and a periphery, surrounded by the society in which the enterprise functions and the world at large. Being socially relevant means constantly striving to anticipate and fulfil specific needs of all stakeholder communities in the ecosystem — including first, the customer community, followed by other stakeholders in the core ecosystem of the business: its stockholders, its alliance partners and suppliers and its employees. Being socially relevant also means constantly striving to meaningfully engage, partner with and contribute to participants in the peripheral ecosystem within which the business functions — comprising industry associations, market institutions, the media, special interest groups or collectives formed by communities that its operations involve or impact, and the various institutions that form part of the legal and regulatory framework within which the business conducts its affairs. For a large globalized business, this could represent a much wider scope in terms of size, scale, diversity and complexity. Being environmentally responsive means constantly striving to increase the level of awareness within the business ecosystem concerning environmental issues such as climate change, energy conservation, waste management, etc., so as to lead to a commitment of resources by the business towards improving conditions in the locations where it operates (or has other interests) or at the very least, neutralizing the impact of the business on the environmental conditions at those locations. Being economically viable means constantly striving to remain profitable in the short as well as the long run. It is obvious that economic viability is vital for success, since a business cannot effectively achieve its goals while its survival is constantly threatened by financial problems. However, businesses that narrowly focus only on their own profitability in purely ‘single bottom line’ terms, to the exclusion of the other goals, or, worse still, to the actual detriment of their host society (or societies, as in the case of globalized businesses) are unlikely to prosper in the long run. Green initiatives have typically put environmental issues ahead of everything else, and Green IT, as the name implies, tends to focus on how to make the IT function as a whole more eco-friendly. While this is not a bad thing as such we believe that the emphasis should be on a holistic, three-dimensional approach to sustainability rather than a one-dimensional one. There is a lot of learning that could be borrowed from Green IT and we are not suggesting that Green IT initiatives must be abandoned, just that they be re-aligned to the broader and more holistic idea of ‘Sustainable Business Technology’. As to why X is not the sum of A+B+C, I would say that the new definition of profitability (and please do look up the Wikipedia entry for triple bottom line for more on this) is a function of the lasting impact of the business on its ecosystem and the economic benefits accrued to the societies that host the business. There continue to be discussions and debates on quantification and measurement of economic impact of social and environmental efforts even today and a large part of the body of knowledge in this area is still evolving as we speak, but there is little doubt that it is an idea whose time has come and is here to stay. A silo-ed approach does not produce the same results. The next post in this series will deal with the notion of ‘Common Good’ in contrast to ‘Self-Interest’, and why the pursuit of the Common Good leads to better sustainability. This entry was posted on December 1, 2009 at 5:33 pm	and is filed under Economics, Environment, Society, Strategy. Tagged: Ecological Economics, FAQ, People Planet Profit, Stakeholder Ecosystem, Triple Bottom Line. You can follow any responses to this entry through the RSS 2.0 feed. You can leave a response, or trackback from your own site.